Lake Louise hotels offer less variety than Banff hotels because Lake Louise area only has a limited number of hotels. But they have a common thing – there are no cookie-cutting hotels in both Banff and Lake Louise. You will find there are less tourists staying in Lake Louise than in Banff. If you are going to stay in the Town of Banff for several days, try to spend at least one night away from the busy townsite, head to one of excellent hotels / lodges in Lake Louise. You will feel different atmosphere in Lake Louise. If you ski at Lake Louise Ski Resort, Lake Louise hotels / lodges are good choice to stay as most of them are very close to the ski resorts and have ski shuttles running between the hotels and the ski resort. 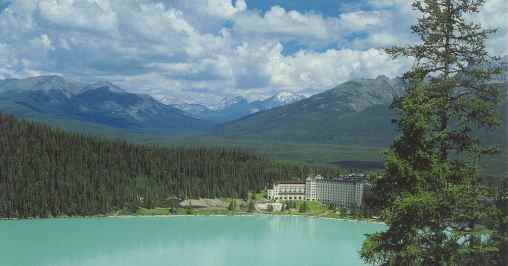 Fairmont Chateau Lake Louise – a public landmark that continues to be selected among the best hotels in North America. My favor hotel to visit and stay. Post Hotel – A exquisite mountain inn, a member of the prestigious Relais & Chateau organization of global fine inns. It locate along the bank of the Pipestone River in the heart of the Lake Louise village. I think this mountain inn is the only real alternative to the Fairmont Chateau Lake Louise hotel in terms of quality and class in Lake Louise area. Besides its property in a very special location. The room was comfortable, the dining was amazing, and the hospitality was way beyond expectations. A friend of mine who stayed there told me that he felt to stay home. His family was impressed by the two owners - two brothers from Switzerland who have been managing this property for over 25 years. They made sure everything had exceeded their expectations, they even took time to sit down with guests to chat, instructed staff and extended a warm welcome to guests. Lake Louise Inn - Tastefully appointed rooms are available for every style and budget. We happened to discover the nice place years ago. We planned to spend Christmas in Jasper and booked hotel there. On the way there, we were stopped by poor road condition at Lake Louise. The road was closed. So we decide to stay rather than go home as it was very late and dark. We were lucky to find that Lake Louise Inn has an available room for us. Their staff were good, friendly and helpful. The room we stayed is nice clean and bit small which is perfect OK for couple. We like the cozy room with smell of real wood burning fireplace. If you have kids, the loft suite with full kitchen is perfect for you. I would recommend this hotel for those wanting to stay in the Lake Louise area without paying a fortune for the pleasure. The inn always have special offers once a while for special events. (403) 522 3791, or 1-800-661-9237 (Canada & USA Only). Num-Ti-Jah Lodge – a popular destination for visitors to the Red earth Creek area. It locates at 40 km north of Lake Louise Village. This rustic and secluded lodge is found 14 km from the trailhead and situated on the shores of majestic Bow Lake and can be accessed by vehicle. There is nothing fancy here, just simply comforts, and an incredible view. Explorer working their way up to Bow Summit the Bow Hut often use it. Visit www.num-ti-jah.com for more info. If you are looking for staying near the town of Banff, in stead of staying one of Lake Louise Hotels, click here to find right one for you in Banff.